Direct current systems used in railway passenger cars have a long history. With a history spanning over 100 years, such systems have included everything from simple battery powered lights to 32 volt DC air conditioning systems, marker lights, and ditch light systems. Today, with the conversion of most cars to head-end power, the requirements of these systems have changed considerably. However, there is still a need for various DC systems on passenger cars. 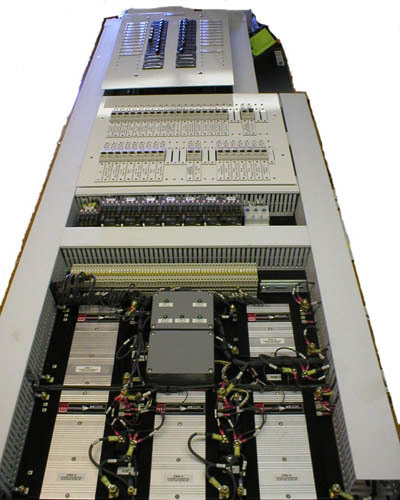 Northwest Rail Electric has produced a wide variety of DC systems over the years. At the simplest, these systems involve a relay to turn on the emergency lighting system when the HEP system shuts down. More complicated systems involve battery charging, circuit breaker panels, and frequently some sort of voltage indication. Even more complex systems may require DC-DC conversion to go between several different voltages. 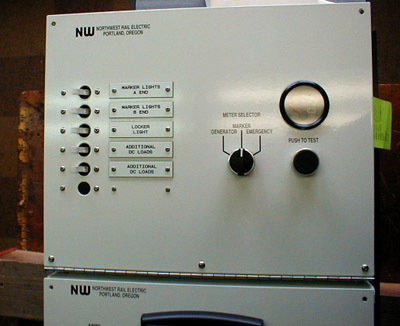 Northwest Rail Electric has produced a number of direct current control systems, including battery charging, emergency lighting and DC-DC systems that are designed to help our customers work with an assortment of voltages in a number of different applications. Most of the time, these DC systems are part of a larger electrical locker package for a complete passenger car electrical system. 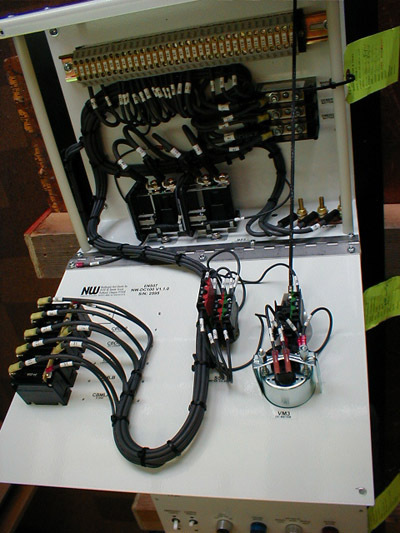 The NW-DCLT-BP-3, pictured above, is one example of a product designed to meet the needs of a number of car operators. In this particular case, all DC systems on the car are 12 volt. There are three battery systems: marker lights, generator starting and emergency lighting. These are isolated when they are being used, but when the battery charger is operating all of the batteries undergo charging. The separation of the battery systems allows the critical safety systems (marker lights and emergency lights) to operate until the battery is completely discharged without discharging the generator starting battery. This system also includes a number of dircuit breakers for the various DC loads, and a volt meter will show the battery voltage when the button on the panel is pressed. The NW-DC-100, pictured above, is very similar to the NW-DCLT-PB-3. However, it features a hinged enclosure rather than a panel configuration. The package is the same height, width, and depth as the NW25-100 and NW25-200 locker packages, allowing it to be easily added as an option to those systems. Note that many of the circuit breakers have been labeled with engraved tags, and where appropriate space has been left for additional future tags. All of the circuit breakers will be visible through the glass fronted enclosure when the system is installed, so it doesn't even have to be opened to determine if a circuit has been turned on or a breaker tripped. The display screen, processing system, USB port (circular connector to the left of the display screen) and certain other components located on the second panel from the top were required by the customer to be covered while in motion, and thus the secondary cover for those systems. The blank covers over the spare circuit breaker positions have not yet been added in this view. The white adhesive paper visible on the door protects the glass part of the enclosure door until the system is installed. Quite a lot of custom sheet metal was involved in positioning the various types of circuit breakers and the display system at a uniform height. 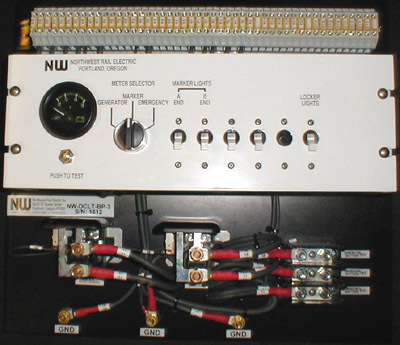 This custom DC control system includes a number of solid state DC-DC converters for taking 72 volts DC and converting it into various other voltages for use on the car for 12 volt lighting, 32 volt control systems for a previously existing 32 volt DC system, 24 volt DC for a control system that was unavailable in any other voltage, and 12 volts DC for several low voltage systems. The middle of the panel is the DC circuit breaker panel for all 72 volt, 24 volt, 32 volt and 12 volt circuits. The top of the panel includes the car's 120 and 208 volt AC circuit breaker panel. All of the circuit breakers are labeled with engraved labels. Here is a simple DC circuit breaker panel used to retrofit a steam locomotive electrical system. The panel includes two pole circuit breakers for a number of different loads, including headlights, marker lights, the turbine generator, and a 32 volt DC voltage indicator. Many of today's passenger cars use nickel cadmium batteries. This package takes 480 volt three phase power from the HEP system and charges a fairly large 120 volt nickel cadmium battery bank.